How Much Does the "Holiday Shopping Season" Really Matter to Retailers? 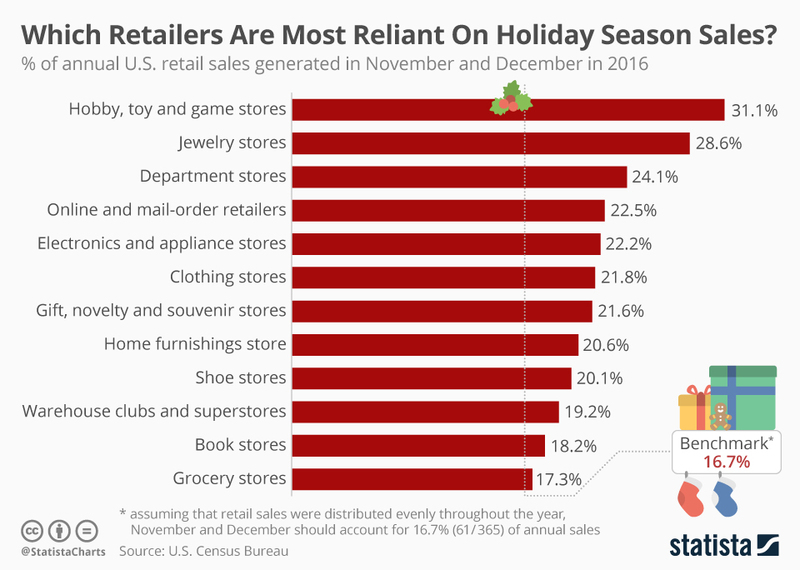 It's no surprise that many retailers rely heavily on the "Holiday Season" to generate a significant percent of annual sales. But does this trend impact all categories and all types or retail the same way? Assuming sales were distributed evenly throughout the year, November and December would account for 17% of total sales for all retailers. So you might be surprised to learn that online retailers only generate 23% of their yearly sales during November and December - a mere 6% increase. It's a pretty interesting point given all of the buzz about online retailers being "brick and mortar killers". The reality is that many shoppers still prefer to experience a purchase in person. Retailers that give shoppers a reason to visit physical stores, by offering a unique "experience", will continue to survive - maybe even thrive.